Brad and Kat from Atomic Zombie have added a new set of plans to their already large selection. The plans for the FrontRunner FWD MBB are now available. Features include adjustable wheelbase for x-seam adjustment and adjustable handlebars for comfort. The FrontRunner has one unique feature that I like, it’s fold-able for storage or transportation. You can find all the information on the Front Runner here. Today I got a little bit of a late start on my daily ride. Maybe I should have stayed at home, but I don’t like to make excuses for not riding. It was hot! Not that I ever ride fast but this really slowed me down as I made frequent stops at the side of the road when I could find shade. I’m a slow rider and I can live with that, but today the buzzards would fly down, mark the road and check back later to make sure I was still moving. This one followed me home, I can tell he has patience. I think it all started when they saw me try to rescue a turtle crossing the road and I couldn’t catch it. At 68 and with various heart issues, I’m finding it more difficult to rebuild muscle mass lost from flying a desk for the last 15 or 20 years than I had hoped. It’s not that I’ve not made improvements, I have. I’m twice as fast now as when I started and can ride twice as far. Put in any numbers you like. As hard as I am working at rebuilding the engine, I’m thinking a lighter weight bike might help also. My introduction to recumbents came with the purchase of an old abused EZ3 from a Craigslist find for $75.00. Someone had put 26 inch rims on it and with that gearing no one could make it roll. With the help of my son, we transformed it into and Atomic Zombie DeltaWolf trike. It has served me well and is comfortable to ride. BUT. But it is heavy and rolls slow. For a couple of hundred dollars there are things I can do to improve one of these problems but it will always be heavy. But is it worth the investment in this trike or would I be better off with a another bike. A couple of months ago, I put a granny 11/34 on the trike. This helped a great deal to climb the 7% grades around my house. But I think regardless of how low you have your gears on a trike, you will always need one gear lower. The lower gear increased my average speed and endurance a lot. But it is still a heavy trike. My son has had a FWD MBB under construction for a couple of weeks. I’ve studied every build of Cruzbike clones that I could find. I’ve watched all the videos. I’m now ready to start construction of what I hope to be my next daily rider. 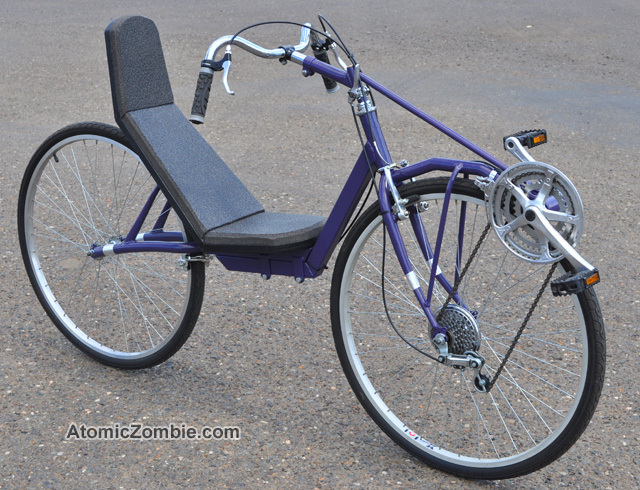 A FWD MBB lightweight recumbent. I’ve already started making 4 anAtomic seats. One for my sons bike, one for mine and a couple of spares for future builds. First two seats will take about 8 or 10 days. I hope by then we will have Davids’ bike finished and mine ready for a seat. 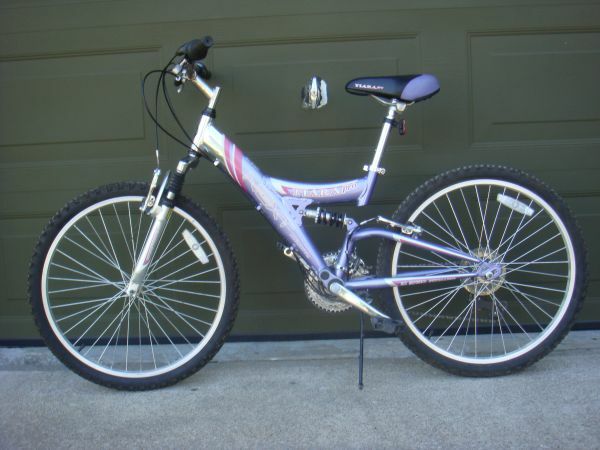 I bought a $25 Tiara Pro aluminum bike from Craigslist to use as the frame for the MBB. I’ll use most of the parts from the Tiara to start with and switch out to better components as I can afford them. I hope to be riding my MBB within a month. Since I am not supposed to use electric arc welding equipment because of my defibrillator implant, I’ve been gathering oxy/ace equipment. I now just need to get the bottles filled and I can do some of the lighter brazing and welding without having to go to my sons house. It will also expand our capabilities where his welder is not appropriate for some of the work. I’ll keep the trike to put a velo body on this fall. I’ve already bought some of the materials needed. I’ve just been waiting for the oxy/ace torch to get started. It will be a geodesic design covered with Dacron. I really though I would be finished by now, but life got in the way. This can wait till the inclimate weather in the fall. I’ll still be a slow rider, but faster. I’ll have to wait and see how much faster. I can hardly wait.